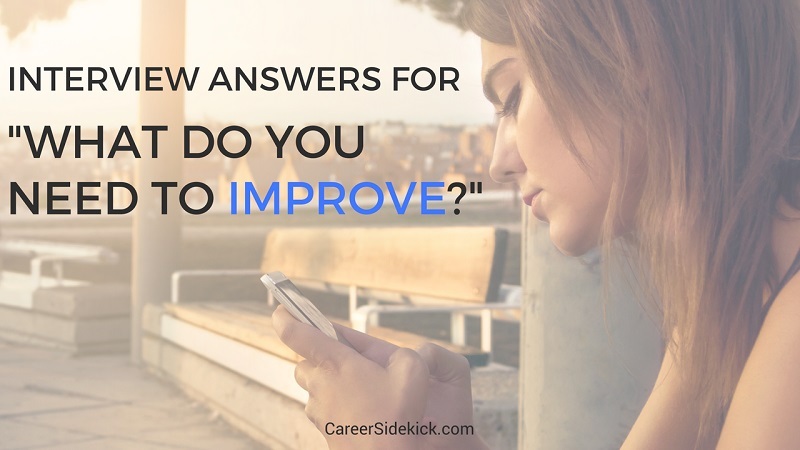 It’s similar to “what’s your greatest weakness?” but a little more open-ended (which means you can really get into trouble if you don’t know how to answer it). When they ask what areas or things you need to improve, don’t give some cheesy answer like “well, I work too hard sometimes, so I need to learn how to take breaks and not work so much”. No hiring manager will be impressed with that. Also don’t name anything that’s vital to the job. If this is a supervisor position, don’t say you need to improve communication and delegation of tasks. That’s essential stuff for being a good supervisor and they’re less likely to hire you if you say you’re lacking in those areas. So when you answer “what do you need to improve?”, pick a real area you’d like to get better in, but make sure it’s not something essential to the job duties. You can also choose something you’re already pretty good at, but still trying to improve even more. That was an example where you took something you’re already decent at, and described wanting to get even better. Whatever you choose to share… be honest, and talk about what you’re working on right now to make this improvement happen. I can’t stress this enough. There’s such a big difference between saying you need to improve something in the future, and saying you’re doing it as you speak. Never sound like you’re waiting for a company to hire you before you start addressing a weakness. They won’t want to hire you if you sound like this and it’s a mistake that’ll cost you many job offers.